New Medicare rules require ALL suppliers of ostomy products such as pharmacies and DMEs (durable medical equipment) stores to be accredited by October 1, 2009. Your local supplier may not meet this new requirement and therefore will not be able to provide you ostomy supplies through Medicare. There is an enormous pile of information on this issue, but here is a Medicare fact sheet to use a starting point. If your ostomy supplier does not meet this new requirement, call the Parthenon Company 1-800-453-8898. 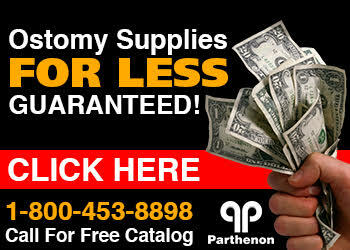 Parthenon is an accredited DME for ostomy supplies with Medicare. Not only that, but we offer free shipping on orders of $100, guarantee the lowest prices in the nation, and carry all brands available. If it's out there, we will do everything possible to get it!! Call us with any questions and find out how much you can save on ostomy supplies today!